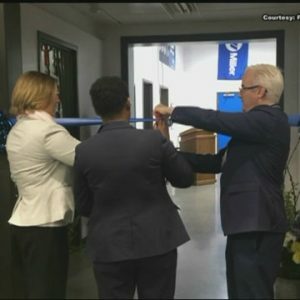 TURNERS FALLS, Mass (WWLP) – Turners Falls’ Franklin County Technical School celebrated the completion of the school’s newly renovated and modernized Welding and Metal Fabrication program Friday. “We had 50 or 60 people in a small group that were all supporters from the community [who] all work with us and partner with us. It was a fantastic joint effort,” said FCTS Superintendent Rick Martin. The state awarded Franklin County Tech nearly $500,000 to modernize their metal shop. The new equipment includes a robotic welding arm and a 90-ton Piranha Press Brake to bend steel. The grant also supported a 1,400 square foot expansion of the shop program. And in today’s industry, there’s demand for state-of-the-art skills.